Living in Luxury is the dream for most people. Click here to play! About the only people who don't want to live in luxury are monks who have taken a vow of poverty, or adventurers who have decided that they are most comfortable when they are uncomfortable. Everyone else would much prefer an easier life, or at least the option of Living in Luxury. 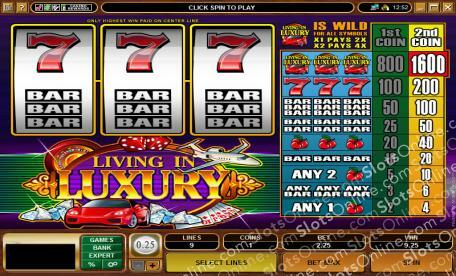 The Living in Luxury slots can help you to make fantasies of a luxurious life into realities. With a generous jackpot, you could find many of your problems wipes away with cold hard cash if you win the top prize in this classic 3-reel slots game. Flights around the world and more could be within your reach if you have the luck to win big on the Living in Luxury slots. The Living in Luxury Logo symbol is wild and substitutes for any symbol. When 1 wild is substituting, winning payouts are doubled. They are quadrupled if 2 wild symbols substitute to complete a winning payline.